When the historic constitutional bill was finally put to vote in the Rajya Sabha, it was the treasury benches which missed the button for Ayes inviting laugher from the whole house. 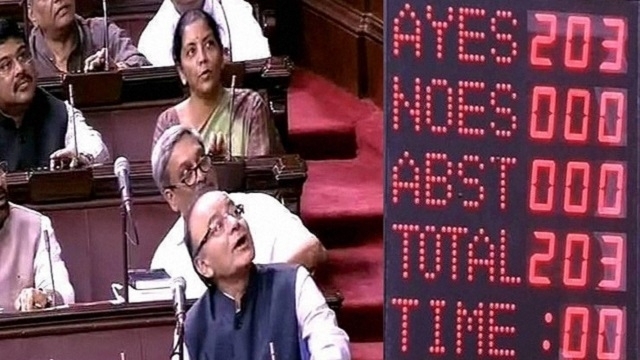 Seeing nine red crosses on their side of the display board, finance minister Arun Jaitley fumed back while other experienced members like Nirmala Sitharaman rushed to the back-benchers to explain the voting procedure. Sheepish BJP benches took some solace when the voting machine gave different numbers of those present in the House during voting for amendments to shift the blame to the voting machine for playing truant. "The lobbies are cleared and doors are closed. But it seems some magician has entered the house," said deputy chairman PG Kurien in a lighter vein to ease pressure on the treasury benches. Every time an amendment was put to vote, the machine reflected a different number of members present in the house. The voting for the bill ranged from 197 to 205 votes. Since all parties had agreed on the bill, everyone had a hearty laugh over varying numbers, with nobody objecting. With dinner prepared for the exhausted members who sat through the gruelling debate, some got piqued every time the machine showed a different number. Some naughty members confused BJP members by asking them to press different buttons. Amid anxious treasury benches, the bill was finally passed by 203 votes, with all Ayes. Had the opposition and treasury benches not reached an agreement on the amendment bill, the voting over the bill could have gone on through the night. In a scenario of division of votes by a small margin, either party could have demanded for ballot paper voting for every amendment. In a situation like that the house would have had to work till the wee hours of Thursday. The voting machine, besides being complex, also ended up showing errors on several occasions, not just in the Rajya Sabha but even in the Lok Sabha. About two years back, while passing an amendment bill in the Lok Sabha, the malfunctioning voting machine showed different numbers, forcing the House to resort to ballot voting, which took several hours. Variations in the result could also be attributed to the fact that there were several new members present in the House, who were voting for the first time. While the Secretary General, before the beginning of voting, explains the procedure of using the voting panel present in front of every member, the system is still quite complex for many to understand.